Meet the Agile Gibbon (Hylobates agilis), also known as the black-handed gibbon. The mammal, part of the Hylobatidae family, is native to Sumatra in Indonesia, where it is known as Owa ungko. The primate is also native to Peninsular Malaysia and Thailand. The Agile Gibbon holds an Endangered (EN) conservation status issued by the International Union for Conservation of Nature (IUCN), and is one of the only three endangered mammals which have been identified in RER. The Agile Gibbon has fur that varies in colour from black to reddish brown. 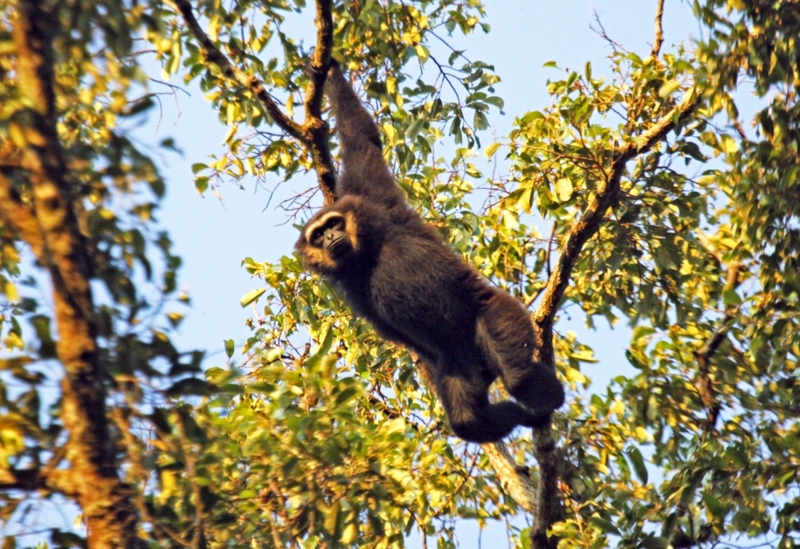 Agile gibbons within the Kampar Peninsula have been noted to have darker fur compared to their counterparts in South Sumatra. These gibbons have white brows, and males are distinguished by their white or light grey cheeks. Generally, the Agile Gibbon weighs between four and six kilogrammes, with head and body length measuring between 44 and 63cm. However, males are noted to be slightly larger than females. Gibbons are not monkeys but apes. Therefore, like other apes, the Agile Gibbon does not have a tail. The Agile Gibbon is an arboreal animal, meaning that it lives predominantly in trees in tropical rainforests, preferring upper canopies and rarely coming to the ground. It moves by brachiation – swinging from branches and tree limbs using its long arms at a fast pace. The Agile Gibbon is frugivorous – which means that it mainly feeds on fruit – but it has also been seen eating leaves, flowers and insects. Agile gibbons live monogamously in pairs in strictly enforced territories. An agile gibbon group is called a ‘flange’. Like other gibbon species, Agile gibbons perform morning calls, with both male and females participating in this activity. These calls serve as territorial marking since they do not use scents to mark. Territorial disputes between gibbons rarely involve physical contact. The Agile gibbon’s call is a series of short bubbling sounds which develops into long melodious howling. However, while other gibbons make a series of low to high tone inclining sounds, the call of the Agile gibbon differs in that it first ascends before turning into a lower tone. This species has a seven month gestation period, after which the female gives birth to a single offspring. This young gibbon is weaned before it is two years old, and will leave its family when it is fully mature at about eight years old, in order to find a mate. The Agile Gibbon became an endangered species as a result of habitat loss, in combination with it being illegally traded within the exotic pet market. The Agile Gibbon is protected under Indonesian law, and listed on Appendix I in CITES (Convention on the International Trade of Endangered Species), an international agreement between countries which governs the international trade of wild animal and plant species. CITES I species are those which are threatened with extinction.